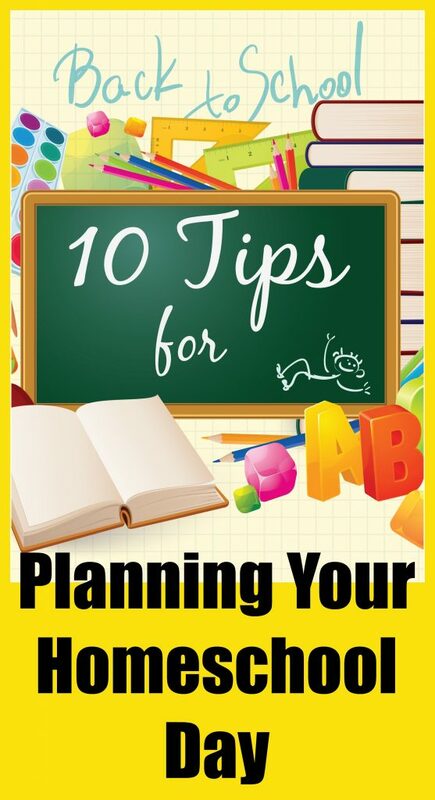 Planning your homeschool day is one of the most important things you can do to prepare for a successful school year. To fail to plan is to plan to fail. 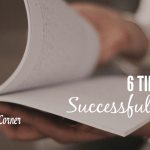 This is part 4 of the series: Plan A Successful Homeschool Year in 5 Easy Steps. 1. Choose between a routine or schedule. Decide whether you are going to operate on a schedule with set times, or more of a routine. I found it worked better for us to schedule things in blocks of time, rather than in time increments. So we kind of had what I call a loose schedule. When we got up we started with the same routine each day. For example, before breakfast everyone had their quiet time. After breakfast we had a Bible time and Scripture memory, then a character lesson. After that we had a big chunk of time for academics. (This included doing daily chores.) We got the most important things done first that way. The kids learned the routine and flow of each day, and if we got interrupted, or one subject took longer than expected, we just continued on with the flow – minus the pressure of “being behind schedule”. You know how often unexpected things come up in a day, keeping us from completing all the things we had hoped to get done in our day. That is why it is so important to plug your priorities into the first part of your day. 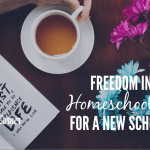 Going back to yesterday’s post Homeschool Goals for Success, the first part of our day should be focused on building our kids faith, then building their character, and THEN academics. When you give God the first part of your day and focus on the Bible and godly character with your kids, I believe God will then bless the time that remains for academics. Even though this may mean you have less time for the academcis and don’t seem to get as much done, you have accomplished what is most important for the day. Starting the day off together focusing on God’s Word together as a family also helps get me and the kids off to a good start with our attitudes! 3. Focus on Core Subjects. Math, reading, and writing should be the top priority as you plan your academic schedule. Add the other subjects in as time permits, keeping in mind what your state requirements are, as well as what your child’s interests are. Don’t feel that you have to do lots of extra subjects. Mastery of the core subjects is what gives your kids a good foundation academically. This is especially important in the early years. Remember, more isn’t always better. Keep it simple so you don’t burn yourself out, and so your kids won’t lose their love of learning. 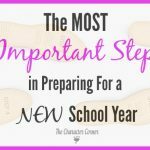 One of the biggest mistakes I made was trying to jump right into EVERYTHING on our first day of school! It was overwhelming to both me and the kids. A better idea is to start with a couple of the main subjects, introducing the kids to what they will be doing, their books, etc. Gradually through the first week or two, add in the rest of the subjects they will be doing. 5. Break activities into small time slots for younger children, and plan for the little ones when scheduling your day. Take short breaks to spend time with the baby and/or toddler. It refreshes you, and makes them feel included and loved. Also, schedule older children to help with toddlers/babies for 30 minute intervals during the school day to free you up to help younger children. Your older children will love being able to play with the little ones, and consider it a nice break from their school work. You can also have older children help teach phonics to a younger sibling, listen to them read, or help them with math. 6. Schedule time to work with each of your children individually, based on their age and needs. Teach the others to work or play quietly while you are helping a sibling. This is a great way to teach your kids to show consideration for their siblings while working quietly and waiting for their turn to be helped. While waiting, they should do the work they are able to do on their own, and put aside the subject(s) they need help with. 7. Include chores in the school time schedule. This is good character training for your kids and it takes a load off of Mom! Decide who is going to do which jobs and when, put it on your master chore chart, and on their school chart. This will make it much easier to maintain an orderly home. 8. 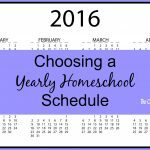 Plan outside activities around your homeschool day. In order to do a good job teaching our kids, we need to be home during school hours as much as possible. Sometimes it is hard to schedule doctor’s visits around your school time, but whenever possible make appointments later in the day. Also, try to combine the outside activities/errands on one day, rather than cutting up several days. 9. Remember that your schedule is a tool, and not your master. Your schedule or routine are great tools to help you stay on track, or give you a rut to run in. Just keep in mind that it’s okay to make changes when needed — or when you just want to do something special or extra on some days. The purpose of having a schedule or routine is to guide your days, and keep you focused on your priorities. 10. Avoid interruptions during the school day as much as possible. Turn your cell phone to silent, and leave it in the other room. Check it at set times to be sure you haven’t missed anything important from your spouse. Not hearing notifications coming in will keep you from being distracted. Let friends and family know that you are “in school” till a certain time daily, and visits are welcome any time after that set time. Not only does this show your children that your school time is important, but this will also make your school time more productive daily. Thank you for the chance to win in your back to school celebration giveaway. Thank you for the encouragement. Thank you for your wisdom. We are just starting this year and I was nervous until I read your posts. Thank you. Leigha, it’s nervous to feel a little nervous about your first school year! However, you CAN do it. You may hit some bumps in the road – we all do. Just work through them, make changes as needed, and keep going. 🙂 Email me if you have any questions! I’m new to your blog and website. I’m so glad I found you. Thank you for all of your wisdom and encouragement. I’m looking forward to learning a lot more from you. God bless you. Whenever I read your posts, I feel like I am listening to a mother-figure giving me advice. Titus 2 woman. 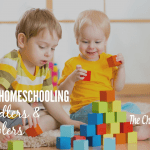 Thank you so much for sharing these awesome homeschooling tips, so helpful!